Unit overall has minor sings of use. Screen and back button works properly. - In good working condition. We cannot fix situations we are unaware of. We appreciate your patience and opportunity to correct a situation if that happens. 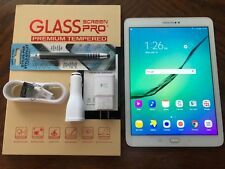 Samsung Galaxy Tab S2 9.7″. No exceptions! Used - Acceptable: The item is fairly worn but continues to work perfectly. Signs of wear can include aesthetic issues such as scratches, dents, and worn corners. GOOGLE ACCOUNT LOCKED. LCD IMAGE IS OK. TOUCHSCREEN WORKS WELL. NO FURTHER TESTING HAS BEEN DONE. WE ARE NOT SURE IF THE ITEM CAN BE FIXED OR NOT. NOT WORKING. NOT WORKING - FOR PARTS - FOR REPAIR. 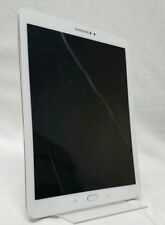 This is for a Samsung Galaxy Tab S2 9.7" SM-T817V 32GB White 4G LTE Verizon WiFi 32GB. The device will have little signs of wear such as minor scratches / scuffs. The device is fully functional and passed our 32 point inspection process. • Storage: 32GB. Condition: Tablet has bad LCD. No display. Untested due to that reason. Used physical condition. Missing sim tray. We do not have knowledge of the history of the item nor can we provide previous owner information. Then we conduct a test for a clean ESN. All Data is removed from the device. The Keypad and touch screen is then tested, along with any Ports that the device has. Lastly the device is cleaned and disinfected.